Father Terrence Curry, S.J., is a teacher, architect and craftsman. A 2001 Loeb Fellow of Harvard University, he completed his architecture studies at the Pratt Institute. Father Curry has taught architecture at U.C. Berkeley, the University of Michigan Ann Arbor, Fordham University, and at the University of Detroit Mercy where he founded the Detroit Collaborative Design Center. In 2003 he received an honorary diploma from Archeworks in Chicago. After finishing one year as visiting professor on a Fulbright Fellowship, teaching architecture design at the Budapest University of Technology and Economics, he founded the Szent Jozsef Studio Kollegium in January 2005 and continued to direct it until August 2008. In September 2009, Father Curry was appointed associate professor at Tsinghua University School of Architecture in Beijing, where he continues to teach design, tectonics and design methods. In his work, he seeks to integrate quality design, service and education to make places worthy of the dignity of the human person. On July 9, the feast of the Chinese martyrs, I interviewed Father Curry about his work in America’s editorial offices. As a Jesuit priest, what is your mission in China? That’s the fundamental question of being in China. Who are we as Jesuits in China? First, it's important to distinguish between mainland China, Hong Kong, Macau and Taiwan. These all make up what the Jesuits consider the China Province. But the laws governing how we can function and what we can do legally on mainland China are not the same as on Taiwan, Hong Kong and Macau. We have several high schools, a theology center and social pastoral ministries on Taiwan, Macau and Hong Kong. I work in Beijing on the mainland. On the mainland, Jesuits cannot engage in public ministry. This is because while the Chinese constitution guarantees freedom of religion it also has certain clauses and limitations to its practice. One of those clauses is that a particular religion cannot be controlled by a foreign government. The concerns regarding religion in general are ideological, but concerns regarding religions that are controlled by a foreign state are historical. Since the pope is a head of state, this poses some problems. Within the government there is what is called the Patriotic Association. Its role is to manage the Catholic Church in China. One of its jobs is choosing bishops. This is one of the key conflicts between China and Rome. For Jesuits, another challenge is that in order to engage in public ministry, priests and religious need to come under the authority of a bishop approved by the Patriotic Association. As an international religious order, our constitutions prevent us from being put under the authority of a local bishop, which causes problems. So what we do in China as Jesuits is limited. And what we can do as foreign Jesuits in the mainland is also different than what the Chinese Jesuits can do. The way many of us approach these complexities is to take the approach of the great Jesuit missionary Matteo Ricci, who understood our ministry as being friends of China, behaving as welcome guests, doing the best we can to understand, respect and obey local laws and customs. In light of this, those of us in the mainland are not engaged in any public, explicitly sacramental ministry. That being said, we have a tradition of teaching in schools, and of approaching teaching as a ministry. So how I understand myself as a priest in China is complicated. The way I approach teaching is different from that of my colleagues. From an Ignatian point of view, we see education as care for the whole person. This approach to education is analogous to Confucius, who sees the primary role of the teacher not so much as passing on information but of what we would call the formation of the whole person. When I see 15 students walk into the classroom who are excited to study for the first time with someone who isn’t Chinese, I try to see them as people’s sons and daughters who are made in the image and likeness of God, who has entrusted them to me for eight weeks. It’s the beginning of a pastoral relationship. Nothing I do is explicitly Christian, but I put a kind of energy and care into these kids that is a bit unusual in the context of where I teach. My students come from all over China. I teach both undergraduate and graduate students. Though they’re ethnically and religiously diverse, including some Muslims from the west, they are all Chinese. It’s a highly selective university, particularly in the School of Architecture. They’re very polite, very kind, very hardworking, and very enthusiastic. They also lack the sense of entitlement that my colleagues complain about in regard to their students in the United States. I see my role with them as pastoral, not in a pious sense, but in the sense of building a paternal relationship with them. I care for them deeply. I also see architecture as an act of co-creation with the Creator, if we understand ourselves as being made His image and likeness. The perfection of our own image is God, or to be alta Christus. God is the Creator and we as His architects are called to be co-creators, and stewards of the earth. The best part of my work is the direct interaction with my students. It’s really the reason for being there. As Jesuits, we sometimes get sent places we never anticipated going. When I was studying architecture in Detroit, I wanted to work in the African-American community, but my provincial asked me when I finished up in Budapest six years ago to go to China. I had never considered going to China and I had no knowledge of the Chinese language or culture. There were a lot of challenges in learning a whole new university system when I got to Beijing. But fundamentally, my motivation for going to China was not that I wanted to go, but that I was responding to the Holy Father’s request for the Jesuits to make working in mainland China an apostolic priority. 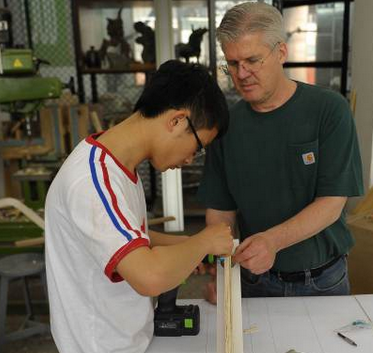 My primary motivation for remaining in China is to work with and care for the students. What personal challenges have you faced in adapting to Chinese culture? For me, the primary challenge of being in China is that I am isolated culturally and personally. There are right now about five full-time Jesuits in Beijing. We get together once a week, but outside of that I live on campus in a small apartment by myself. That presents certain challenges on a personal level. Good teachers have healthy affective relationships with their students, but you also need to develop clear boundaries. You don’t become best friends with your students because you can’t be their teacher if you do. So while I do have healthy relationships with my students, living on the campus is isolating, because Chinese traditional culture divides your social world between your work, family and personal circles. My colleagues are very busy. Many of them also speak English quite well. So I have friendships on the faculty, but many of them are limited to collegial interactions. How does prayer help you deal with the loneliness? Ignatius has this great prayer to “give generously and not to count the cost.” This is a prayer that both haunts and helps me. I was not very well-trained for working in the Chinese culture, but I do have a skill set that enabled me to get a job very quickly. So I’m there. Prayer for me, in China, is related strongly to the idea of putting yourself outside of your comfort zone and in a place of vulnerability. By doing so, you can encounter God in a very special way, if you keep your heart open. When I went to Hungary, I found myself in the eastern part of the country, and I had a profound sense of powerlessness. But I also had a profound sense of God’s presence in my powerlessness. When my provincial sent me to China, I wanted to have that experience again. So a significant part of my prayer life is this emotionally exhausting surrender to the place of powerlessness where God is sending me. My prayer is a very dynamic, fluid conversation between where God is calling me and how I can serve God more fully. The consolation is my students; the desolation is how emotionally exhausting my work can be. I think the analogy is the exhaustion most people feel from traveling. When you travel, you’re always in a state of hyper-alertness, but then you come home to a week of exhaustion as you ease back into your own world. But I’ve been working in this state of hyper-alertness for five years now and it’s exhausting. The connection between prayer and living there is rooted in physical and emotional well being. Finding the right balance is a big part of doing missionary work in foreign cultures. What’s hard about working in a Communist country? One of the unique challenges of working in China, as opposed to Hungary (which is a post-Communist country), is that China is still Communist. But it’s Communist with Chinese characteristics. Probably just 10 percent of my students are members of the Community Party, even though it’s a politically elite school. My dean can only approve certain things, whereas the Party secretary approves other things. There’s a mix between the political party and higher education in China that we in the United States like to believe doesn’t exist in our own schools. For example, Harvard may have a certain political leaning, but it is not controlled by a political party. In China, it’s completely different even from Budapest. When I teach in China, I have to sign a paper that lists five or six things they expect of me. I cannot criticize the Party in public. I have to respect local culture and not proselytize. I have to respect the single-child policy, which is funny since a friend noted that it’s not really a problem for me as a priest. And it’s an officially atheist government that regulates information. China is separated from the rest of the world, even on the Internet by what some call the “Great Firewall.” For example, there’s no Facebook in China, and there’s no New York Times for the past two years. There’s no YouTube in China. My students are critical of this government in the same way that we in the U.S. are critical of our government over certain policy decisions. But my students also talk about their deeper hunger for meaning, showing a real desire to participate in group activities and to give back to others. They seem to realize that the acquisition of property is not enough, because there’s greater meaning to life. That’s my biggest opening to talk about deeper things. I try to inspire students with the idea that making buildings is an extremely important way to influence how people live in the world, how they live with each other, and how they define themselves in relation to nature and to each other. This is very exciting and inspiring to them. If you really take the idea that we are all images and likenesses of God, alta Christus, then buidings can be thought of as “tabernacles,” places where we preserve the real presence of God. Over the last few years, my teaching emphasis has been on tectonics, emphasizing the characteristics and properties of materials as a generator of form over a purely functionalist and formalist approach. I try to encourage the students to not only focus on the plan but to acknowledge the materiality and the experience of the building design. In architecture school, we tend to get away from the fact that buildings are really little more than a stack of bricks with steel inside to keep them from falling on your head, and we end up thinking of building design in more abstract and conceptual terms. But a building is really an incarnational or embodied reality. In my research I am arguing for a greater emphasis on thinking about architecture as real buildings, not just abstract design in design education. I think many designers and people have lost touch with the “stuff” of the world. We look at it and think of everything as manufactured and mass produced. We see an old wooden table, but miss the mark of the craftsmanship. I like to look at the bricks that line the walls on the FDR Drive here in New York. The mark, the evidence and the “smell of the work” are right there in front of us. When we pretend these things aren’t there, we lose sense of our humanity and our sense of being an integral part of creation. I’m hoping these ideas influence my students and influence hundreds of thousands of people in the buildings my students make. In one month, China builds more buildings than the rest of the world builds in a whole year. I hope my students will recognize the architect not just as a public intellectual or form maker, but as a maker of buildings for real human beings who are themselves designed in the image and likeness of God. Do you have any final thoughts about China? One of my first experiences as a Jesuit novice was an assignment in Harlem. I remember coming up the stairs of the subway station at 125th Street and being confronted with the cultural expectation that I was in a place of danger, but also with the spiritual and theological understanding that I would be encountering the image and likeness of God. In China, I’m confronted with the same dilemma. Do I see the people as “other” or do I encounter them as fellow human beings made in the image and likeness of God? Do I keep my heart open to what my students are offering me, or do I dismiss it as the manipulative attempt to gain favor from a foreign teacher who will help them study in the United States one day? Do I recognize Chinese customs, like how you eat, and how you respond to personal requests, as valid ways of seeing the world? What I take from this, again, is that it’s an opportunity to put myself in a place of vulnerability, recognizing God’s real presence in the eyes of my students and in the context of my work in China. It’s all about being friends with China and seeking to encounter God as He manifests himself in China.